We’re candling some of our eggs tomorrow – Tuesday at 4:45pm with the Darien Dragons 4-H Club! Candling is a lot like a ultrasound for eggs. 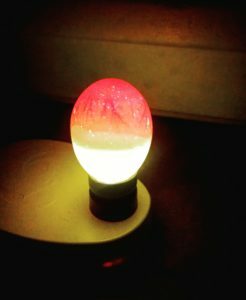 It is the process of looking at the inside of a developing egg by shining a bright light through it. Candling is used by people who are incubating chicken eggs to test whether an egg is fertilized, in good quality, to test which stage of development it is in, and to see whether the embryo is developing as it should. Because it is important not to handle the eggs too much, we will not be looking inside of each of the eggs – only 2 or 3. This is a fascinating opportunity, open to all who are interested. Join us in the Youth Room.